I want to start by saying hello to anyone who is new to my blog as a result of my guest post over at Carrots n Cake. Welcome! 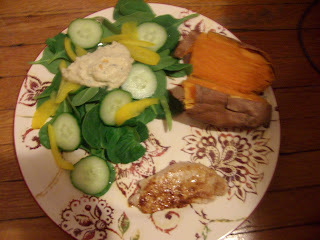 And if you haven't seen the post yet, check it out for some of my tips for dining out. 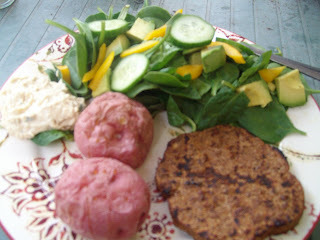 Special thanks to Tina for including it on her blog! There was no meal plan this week. Yes, you read that correctly - no meal plan. Why? Because we didn't go grocery shopping!! This left me having to wing it most of the week as I picked up things a couple times this week. It worked out fine and we didn't go hungry!! 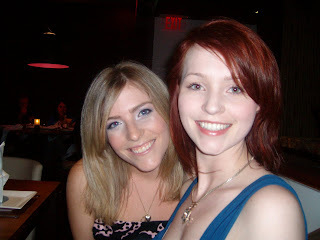 Last weekend I head to Oakville to celebrate the wonderful Jess' birthday! Congratulations are in order as Jess called goal on her birthday! I love this gal and I'm so happy that we met as a result of Weight Watchers!! I consider her one of my best friends and it was really great to spend some quality time with her. 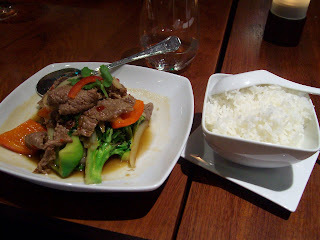 For the meal we went to Bahn Thai in Oakville - it was a beautiful restaurant! The decor was stunning and the food was delicious!! I chose the thai beef and was assured that there was no extra wheat or gluten added - hooray! It was so nice to spend time with my beautiful friend and her friends and family! 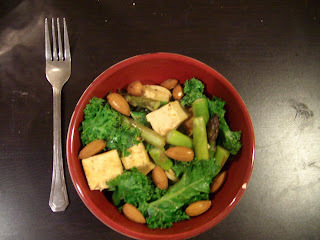 Here are some meals that took me through the rest of the week including a bbq, a Laptop Lunch, another incarnation of the asparagus & tofu stir fry among others. On Friday Joey's bands were playing a show at the Press Club. Joey is an incredibly talented musician. Before I met him, he was in a band called the Awesome Team and they put out some music, did a Canadian tour, played a lot of shows and even had a video on Muchmusic. I still love listening to the Awesome Team songs on my ipod and I'm really happy that Joey is still playing music. 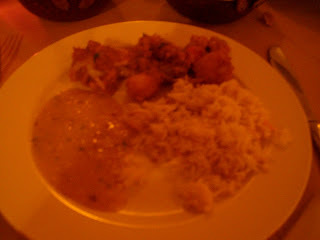 The food was very yummy. 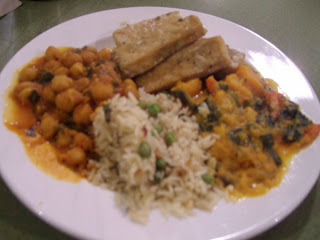 We shared a bunch of vegetarian dishes including aloo gobi and a yellow lentil dish. Lori also had some palak paneer and naan. The show was awesome!! I love watching Joey onstage and bopping along to all the songs. They played a great new song and overall I really enjoyed the show. On Saturday Joey and I decided to be a bit adventurous, and headed out for some Ethiopian food. We've never had it, but heard that it was good. The people were right!! When you have Ethiopian food, you don't get cutlery. 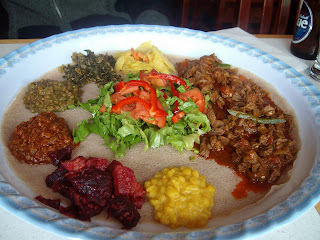 Instead you eat everything with folded up pieces of injera - a type of flat bread made with teff flour, which is gluten free! Joey chose a beef dish and I opted for the vegetarian combo which included lentils, split peas, beets and various other veggie dishes. I enjoyed everything! The injera takes a little getting used to, but it's quite freeing not having to worry about cutlery. We did not finish everything that came on our platter, and our server seemed a little offended that we hardly touched the salad in the center. We will definitely go again! I'm now off to write a grocery list and meal plan for this week. I missed it! I'm also having brunch with an old friend this morning so be sure to watch for another post about Live!! 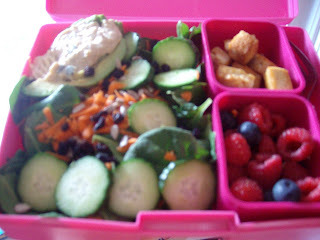 Just wanted to say that I ordered a laptop lunch a few weeks back when I read your blog!! I love love love it!!! The kids in my program asked me if it was more fun to eat out of it..to which I replied..why yes, yes it is! Anyways thanks for the great ideas :) Love your blog. Hi! I'm a gluten free kid, too! I LOVE Indian and Ethiopian food! Your blog is A-DORABLE!